Note: this post is written specifically for SharePoint 2013. 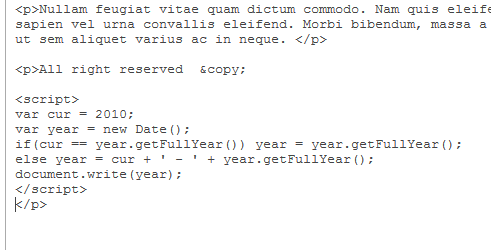 You can paste the code directly into the page content. However, once you save the page and view it, you will see that SharePoint does not realize that it is code it needs to render in some way. Conclusion: do not place code directly in the page content as it does not work. In most content editor webparts and all rich text areas, there is a button in the ribbon called “Edit source”. This is great for quick fixes when content has gotten out of hand. 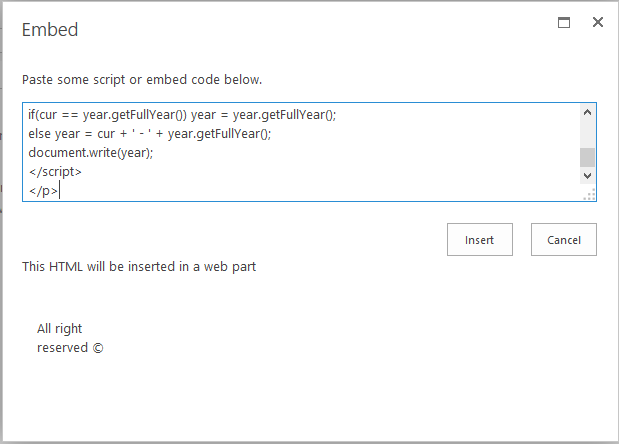 In older versions of SharePoint, you could also use it to embed extra code. You can easily paste your code straight into the Edit HTML window. However, once you save, SharePoint lets you know that the code that it does not approve of has been stripped. In this case, some of the embedded code has been stripped out. Sometimes SharePoint will strip out all of it and sometimes it will only strip out parts which can cause an odd result. When it doubt, check back into the HTML source to see what has happened with your code and if it is still 100% intact. Conclusion: while this used to work under some older SharePoint versions, it is generally not a reliable solution for SharePoint 2013. 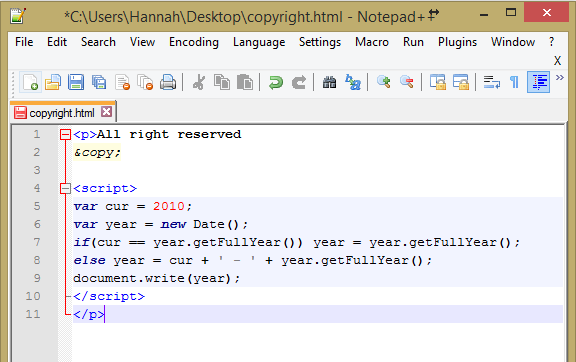 SharePoint creates a Script Editor webpart on the page for you. It even includes an “Edit Snippet” button, so you can go back and edit the code later. Conclusion: in my experience, this works but is dependent on the complexity of the code. Test well before using. In this demo, I uploaded the HTML file to the document library on the same site as the page we are working with. 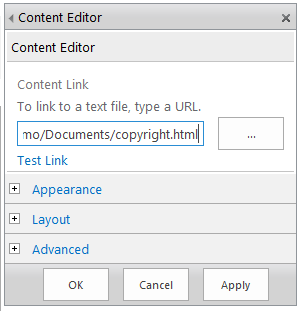 Next, place a Content Editor Web Part (CEWP) on the page and edit the webpart settings. At the top, add the link to the file and click “Apply” to save the changes. The content should immediately display in the CEWP on the page. Tip: if you wish to use the same webpart in many places, you could export the configured CEWP and import it as a custom webpart. You can then place it on a page and it will already be configured for you. Conclusion: this is my favorite method due to the central storage of the files, ease of editing the files and reusability. Great article. Thanks so much Hannah. You just helped me understand sharepoint a little bit better. So thank you ! Hi Jared! Option #4 is definitely the best, as you can control the link better. You’ll see it’s also the approach I used when configuring the solution on https://sharepoint.hannahswain.eu/2013/04/26/using-the-open-in-explorer-link-on-sharepoint-2013/. Good luck! This isn’t actually junk, in my opinion – it’s a security measure. Admittedly, the behavior has changed a bit from version to version of SharePoint. As for why your code isn’t working… the only thing I can think of is to test the code outside of SharePoint in pure HTML. Good luck! Thank you HANNAH for the article. I have tried option #3 with embedded web part and it didn’t work for SharePoint 2013. I copied the script from your blog exactly into the snippet editor. It only worked as a code snippet because the tag was html escaped. However when I put actual tag, it worked fine exactly as you described. Just wanted to contribute this subtle point. I also subscribed for your blog as I find it very interesting. Hi! I’ve used the content web part for adding a script that sets different background colors for the records in a list (web part). That works when opening the list (the page) because then the content web part is read. However, when sorting or searching in the list the content web part is no longer in action and thereby the background colors disappear. How can I make sure the script is considered also after sorting or searching in the list? Would you know? Hi Martin! My first thought is to wonder if the sorting and filtering are using a different page which doesn’t include the cewp. Beyond that, I’m not sure. Hi. Thanks for replying so fast. The url changes with information related to what column has been sorted etc. By that it’s a different page but there’s no way to edit that page. My thought was to either call the script from the list web part and thereby considered no matter what is done regarding sorting or filtering, or somehow make sure the content web part is considered everytime. None of them seem to work out though. It’s okay if the arguments on the url change, as long as you are still on the same page. Ok, then I know. Thanks anyway! Thank you so much this is just what I was after! Solved a problem I have been mulling over for weeks! Thanks so much for letting me know – I really appreciate it!